A female Trump supporter made nearly $4,000 last week after selling Hillary Clinton targets at a rally for Donald Trump, according to reports. 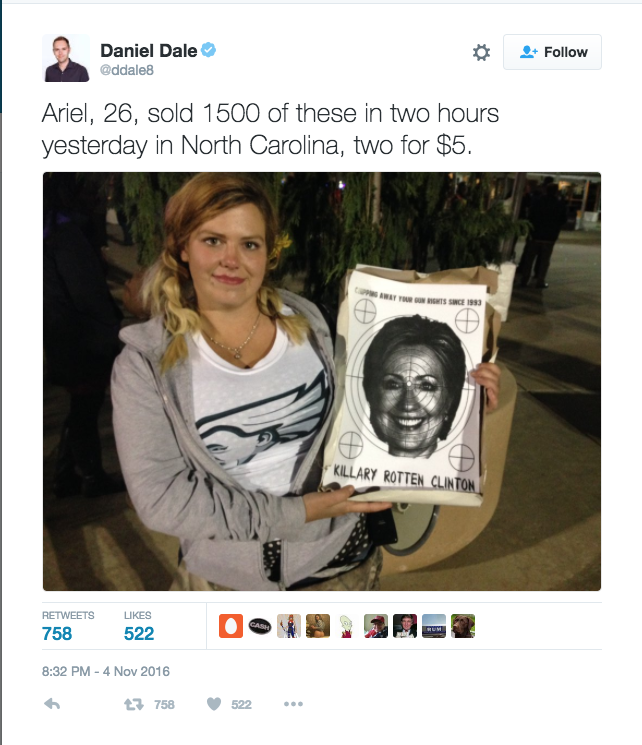 The 26 year-old woman, Ariel, sold the targets on Thursday at Donald Trump’s rally in Hershey, Pennsylvania and made roughly $3,750 in the course of two hours, which equates to nearly $2,000 every hour. The target showed a picture of Hillary Clinton’s face on a bullseye target with the words, “Chipping away your gun rights since 1993. Killary Rotten Clinton,” written outside the bullseye. Despite receiving backlash for the targets, Ariel managed to sell roughly 1,500 targets in the course of two hours. She sold the targets at the price of two for $5. Op-ed: Gold Star Siblings - An Organization To Aid The "Forgotten Mourners"